Janzen stresses the theological themes permeating Genesis 12-50 as calling for theological reflection and religious response, and shows how the story of Israel's ancestors has continuing significance for all humankind. 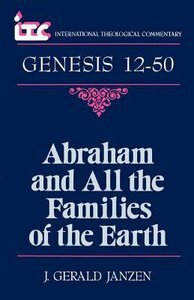 About "Itc Genesis 12-50 Abraham & All the Families of the Earth (International Theological Commentary Series)"
J. Gerald Janzen is MacAllister-Petticrew Professor Emeritus of Old Testament at Christian Theological Seminary in Indianapolis, Indiana. He is the author of numerous books and articles on the Old Testament.